How irritating and painful it is to have have dry, chapped lips! I always have dry lips no matter the season so I always make sure that I have something to soothe it. For the past year, the Aquaphor Healing Ointment has been my HG remedy for chapped lips. It has done wonders to my lips and I usually apply it on my lips on the evening before going to bed and before doing my makeup in the morning. Recently, I've been trying out this lip essence from the brand Brilliant that was included in my BNT Beauty Box and although it's not really a remedy for dry lips, it has helped my lips a great deal during the past few weeks I've been trying it. 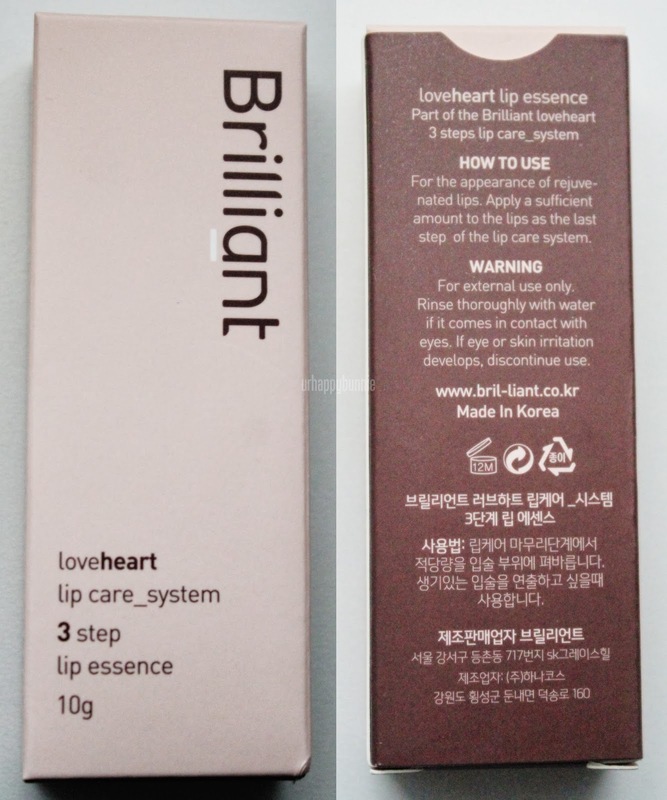 The Brilliant Love Heart Lip Essence is the 3rd part of this 3 step lip care system. 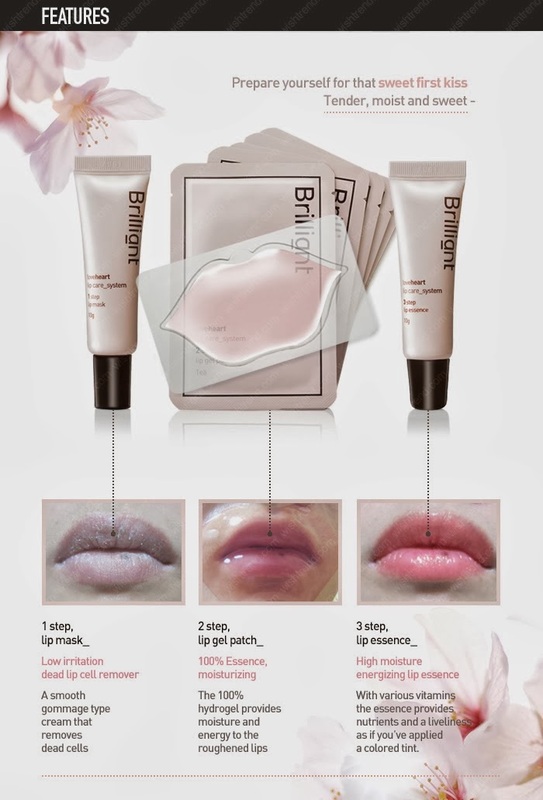 Step 1 is the Lip Mask that helps remove dead skin, Step 2 is the Lip Gel Patch which provides hydration and Step 3, the Lip Essence provides high moisture and adds a subtle pink tint to the lips. The lip essence comes in this typical lip gloss tube packaging and it has a slanted plastic tip where you can dispense the product and can apply it at the same time. The product smells like peaches and if you are familiar with the Tony Moly Peach Anti Aging Hand Cream, it smells exactly like that. This lip essence is in a pastel pink color. On the lips, it goes on clear but given a few minutes it does turn the lips slightly pink but hardly noticeable for me. It is not a balm-type of product so it is not thick. It feels exactly like a lotion for the lips and upon rubbing the lips together, it feels a little bit greasy, like you have just eaten something oily. It is not that unpleasant of a feeling but it weirded me out on the first couple of times I've used it. As you can see on the photo above, before I applied the essence, my lips were dry and pale looking but after application my lips look moist and alive. It is my first time trying out a lip essence and though it is not, as I said, a remedy for dry chapped lips, it is a great lip primer and moisturizer for mornings or before makeup application. If you're like me whose lips get extremely dry during sleep, then I suggest applying something thicker on the lips. This Brilliant Lip Essence has been in my makeup bag since I got it because it is very convenient to apply on the go and I can just apply it any time I feel like my lips are getting dry because of the cold weather.